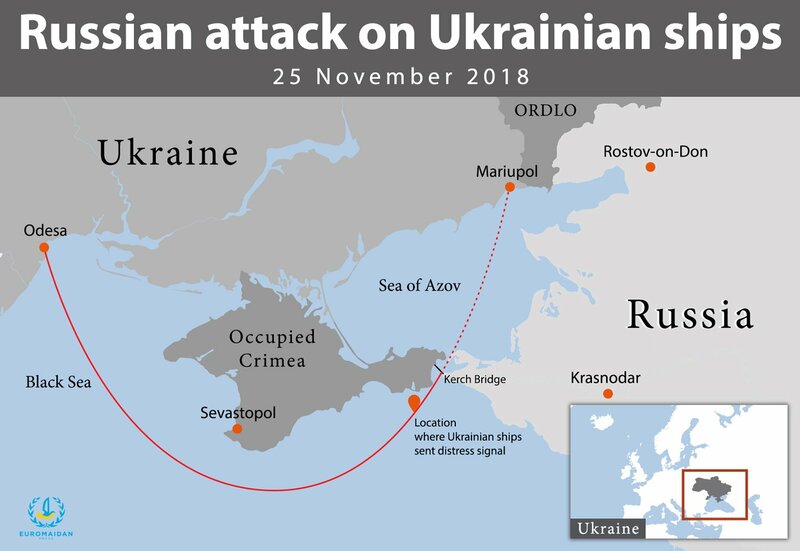 On its press briefing in Kyiv on November 29, the Security Service of Ukraine (SBU) made public the intercepted communications between Russian aircraft pilots which took part in the attack on Ukrainian Navy ships on 25 November, before they were seized and 24 sailors imprisoned. The intercepts appear to show that a Russian fighter jet and a military helicopter blasted the three ships with unguided missiles. Note: this article has been updated to include a comment by Andras Racz, security analyst at the Hungarian policy think tank Political Capital. On its YouTube channel, the SBU shared the corresponding records presented by SBU Deputy Head Oleh Frolov at the briefing. SBU operatives “used technical means to access the talks of the crews of the Russian Su-30 jet and the Ka-52 helicopter with their command center,” Frolov reported. “These talks leave no doubt that the Russian military command deliberately ordered the use of weapons against Ukrainian ships,” said Oleh Frolov. The recorded radio communication between a pilot of Russian Sukhoi Su-30SM fighter jet (call sign “509th”), a controller (call sign “Jumper”), and a Russian Navy ship (call sign “Mantilla”) happened on 25 November from 18:43 until 20:36. The helicopter pilots (call signs “9-47” and “9-49”) received the coordinates also within the period from 19:12 to 21:42. They were first told: “Enter within the weapons range, don’t use weapons until further advised,” later the instructions were changed. “9-47” reports four vessels spotted, two sitting and the other two moving toward them. No order to use weapons is heard in the record, but it becomes clear by the reporting of the “expenditure of karandashi” (“pencils,” a military slang word for unguided missiles) – the 47th had none, the 49th shot away two. The record ends at the question of the controller to the “9-47” helicopter pilot on how many “karandashi” they have left. “This communication between the crews of the Su-30 jet and Ka-52 helicopters disclosed using weapons against Ukrainian Navy ships. The conversations clearly point to the usage of two ‘pencils’ as by Su-30, as by a Ka-52,” Frolov explained to journalists. According to him, the aircraft purposefully used the weapons and returned to their places of permanent deployment. “These talks leave no doubt that the Russian military command deliberately ordered the use of weapons against Ukrainian ships,” Oleh Frolov emphasized. As reported earlier, during the attack on Ukrainian vessels in neutral waters near the annexed Crimea, Russian military and border guards fired for effect on Ukrainian Navy crews. The invaders took captive 24 Ukrainian servicemen. “It is perfectly possible. […] most probably, the Russian air units did not intend to actually destroy the Ukrainian ships and kill all the crews. Had they intended to sink them, they would have fired a lot more missiles, and possible even used gunfire, particularly from the helicopter. The radio transcript seems to support this assumption. According to the radio transcripts, at 19:57 the Su-30 requested to be the first one to do the job, while it was still 24 kilometers from the target. At 20:05 the Su-30 already reported that after firing two missiles, its job was done and it was already returning to the northern point. Had the Su-30’s job been to destroy the Ukrainian ships, most probably it would have at least double-checked the results of its fire (thus would have realized that no, ships were not destroyed and were still afloat), hence probably would have fired a lot more than only two missiles. K-52 helicopter launched two more rockets. Ship-based large-caliber naval artillery armament was used. Later Russian special forces assaulted the vessels and used physical violence against Ukrainian sailors. “The sixth type of violence is still on – physical, moral and psychological pressure and illegal arrest of 24 servicemen,” says SBU. “The fire targeted exactly the cockpit where Ukrainian sailors were located,” stressed Oleg Frolov. How much will Crimea cost Russians?